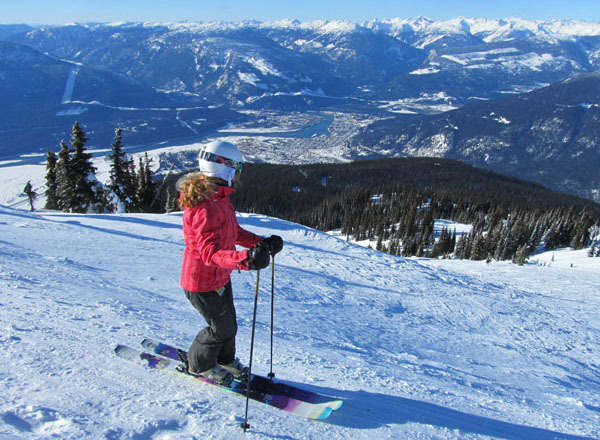 Revelstoke is a serious skiers’ and riders’ mountain, with the biggest vertical in North America at 5,620 feet, and 3,121-acres of skiing including two high alpine bowls and 65 trails. Revelstoke Mountain Resort is also the only resort in the world to offer lift accessed resort skiing plus cat skiing, heli skiing and backcountry skiing all emanating from one village base. You may want to save a family ski trip to Revelstoke until the kids are skiing double black diamonds, this is not a beginners mountain. Revelstoke is unique in that you can also enjoy Cat Skiing and Heli Skiing for day during your stay. Revelstoke skiers and snowboarders can access a total of 515,000 acres of diverse terrain and options in all kinds of weather from snowy white outs when helicopters can’t fly or lifts can’t run, but cats can. Revelstoke’s’ lift accessed trails are long – served by the Revelation Gondola and the Stoke Quad Chair on the Front Side, steep and scenic, as you descend towards to the Columbia River. There is one green circle run, The Last Spike, that swerves the entire Front Side 10 miles to the base. The North Bowl offers really fun glades and a few blue runs of the Ripper Quad, plus hike to terrain or traversable steeps in North Bowl and Greeley Bowl. Revelstoke is relatively new, with premium lodging like the posh slopeside Sutton Place Hotel and Sandman Hotel Revelstoke. We recommend you stay at Revelstoke’s Sutton Place Hotel, a ski in ski out condo style hotel with condominium suite living, fireplaces, washer dryers, and full kitchens in unit, plus the amenities of a full service hotel including concierge service and ski valet, underground parking, an outdoor hot tub, and you are right next to the terrain park and learning center for the kids – the best of both worlds for skiing families. Best of all you are just steps the slopes and the lifts, and a short walk to dining in Revelstoke’s compact village. The ski joke about Revelstoke is that it snows so much here, skiers get Revel-stuck. Not really a bad thing?! Revelstoke is 4.5 hours from Calgary Airport on the Trans Canada Highway, passing through beautiful Banff National Park, the town of Golden – home to Kicking Horse Ski Resort, and Glacier National Park. A trip to Revelstoke should include a stop over at Lake Louise, you pass right by going through Banff, and a few days at Kicking Horse.